Smile makeover Preston, Adelphi Dental Care cosmetic dentist Preston. Get a perfect new smile. How do you feel about your smile? Do you find yourself thinking about it a lot and wishing that you could fix specific flaws or even just improve generally on what Mother Nature gave you? Other people may not notice the flaws you see; your friends and family probably tell you that you look amazing but if that’s not how you see yourself, you may find that your feelings about your teeth and smile are chipping away at your self-esteem. Rightly or wrongly, we live in a world where people focus on appearances. Celebrities grace the covers of magazines with their Hollywood-white smiles and more and more television programmes and advertisements feature people with beautiful teeth. The truth is that we all respond to confident, smiling faces and to be on the receiving end of this positive response can send our confidence sky high. If your feelings around your smile are holding you back in some way, it’s never too late to take action. Sometimes giving you the smile you’ve always wanted isn’t a case of correcting one problem or using one specific treatment. 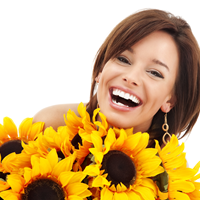 It may be that to fully makeover your smile, you’ll need a personalised mix of treatments. In other cases, a small change can make a big difference. With a smile makeover, we spend time with you to find out as much as possible about what you like and dislike about your smile, as well as your hopes and worries, if you have any time constraints and your available budget. We’ll look closely at your dental health and put together what we consider to be the best treatment plan for you as an individual. How do smile makeovers work? A smile makeover can include treatments such as dental implants, tooth whitening, braces, restorations and even facial aesthetic treatments using Botox or dermal fillers. Our aim will be to consider the aesthetics of your facial structure and how your teeth could be enhanced to give you the best version of your natural smile. From this, we’ll be able to recommend different treatment options and talk you through why we think they are preferable. In our experience, smile makeovers transform not only smiles, but lives. They create confidence, boost self-esteem and help people greet the world and all the opportunities it presents with a smile on their face. If there is something about your smile that you’ve always disliked; if you hide at the back of family photos or talk from behind your hand when you meet someone new, then a smile makeover could change your life. To find out more, you can book a free one-hour new patient consultation by calling 01772 253 443. We have flexible appointment times to make visiting our Preston-based clinic as convenient as possible. You can also email us at smile-adviser@adelphidentalcare.co.uk. Always fabulous and accommodating. Always informative. Do you wish you could change your smile?